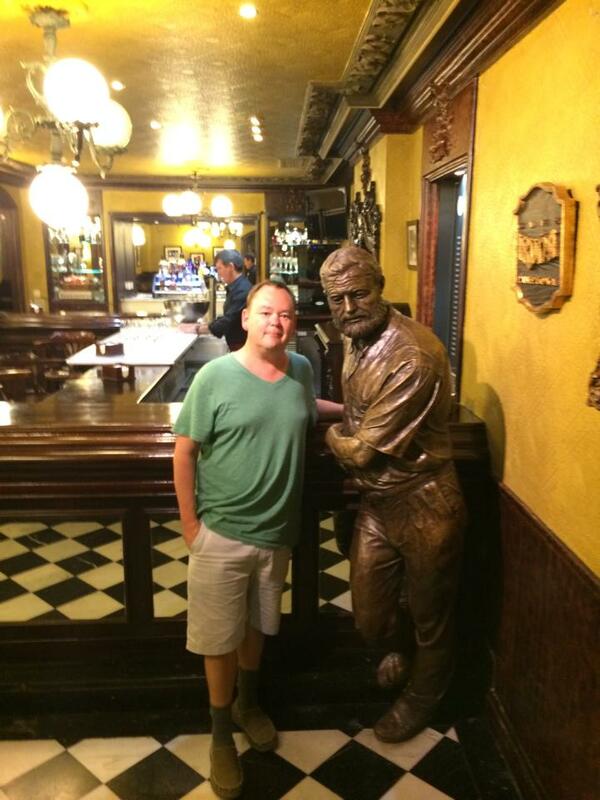 Brandon Schrand in Pamploma next to a statue of Ernest Hemingway. Being immersed in something can be a blissful state of complete absorption or it can be that scary feeling you might just be in a bit over your head. As the program adviser for the University of Idaho International Studies program, Kelli Schrand knows these feelings well as she prepares IS students – many of whom have never traveled outside the United States – for living abroad. This summer, Kelli got to experience the thrill and challenge of living in another country when she received one of the university’s Faculty/Staff International Development Award (FIDA) to study in Spain. Preference for the FIDA grants are given to faculty and staff who have limited experience living abroad. Kelli, like many of the students she advises, had no international travel experience. She and her husband, Brandon, who is a UI creative writing professor, found out about the program several years ago. The stars aligned this year when Brandon applied for a University Studies Abroad Consortium (USAC) opportunity to teach “Hemingway’s Spain” at the Universidad del País Vasco in San Sebastián. After he was accepted, Kelli applied for the FIDA award to study Basque language and traditions at the same university. USAC offers teaching opportunities in many countries, but Brandon says Spain was a great choice for a variety of reasons. Maddie, Mason and Kelli Schrand at the seaside in San Sebastian, Spain. “How could I teach a class on Hemingway - in Spain of all places - and not teach “Death in the Afternoon.”? Because it is an intimidating book – vast in its scope with an enormous glossary of highly specialized Spanish terms – I thought my students would be, well, bored by it. Secretly, I wondered if I would be bored by it,” Brandon says. 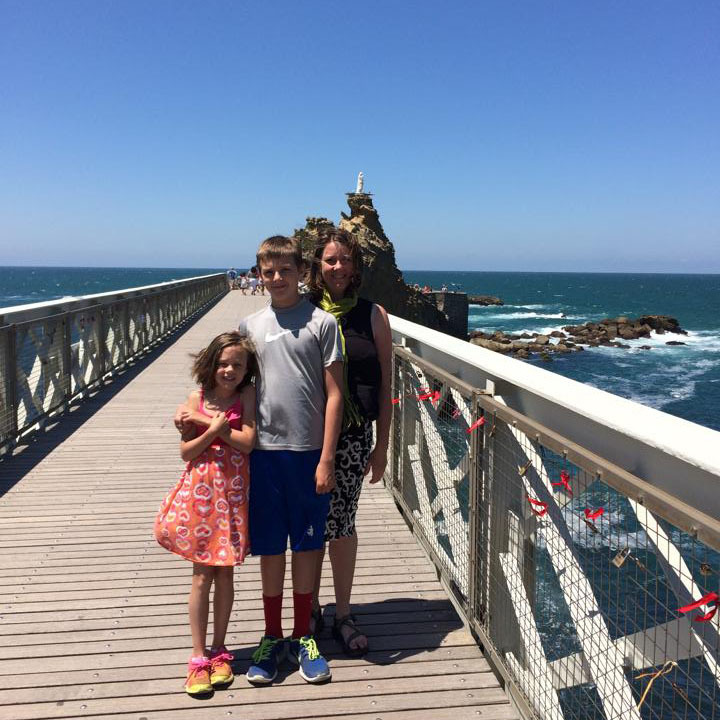 While Brandon was teaching and Kelli was in class learning about Basque culture and customs, the Schrand’s two children, Mason, 13, and Maddie, 8, had their own unique experiences. “They really liked how the other kids played. They’d go off and get ice cream, go to the park or spend all day at the beach. We could give them lots of independence because it was such a welcoming community,” Kelli says. The siblings also joined their parents as they went on numerous cultural field trips. Among their outings they visited a Basque farmhouse dating back to the 1500s, as well as a hike from France into Spain through the Pyrenees Mountains. Kelli added that the experience has been life changing and will very beneficial in her day to day work at UI. Both say they would go back to San Sebastián in an instant, but they are also excited about all of the possibilities.